(No creatures were harmed for this image). Excellent still life - really interesting mixture of textures and colours. I also like the fact that the colours appear slightly muted and the light level that you have chosen to give us. Superb image - both simple and clever at the same time, inviting you in to examine the detail of each item then drawing you back out to appreciate the simple composition and beautifully faded colour palette. Nice one, very Victorian! This would make a great book illustration. The tones are really excellent. Yes i like this a lot too. It reminds me of something I'd see in the Horniman Museum, or the V & A, yes. Is "Found" a sort of photography genre? I've heard that term somewhere. Its very odd to me, not having any sort of visual art background. I admit I don't quite get it, a strange collection artificially organised for display. Like many of the Victorian exhibits in those museums, they are an acquired taste ..... perhaps more accurately an expired taste for some! Nicely photographed for sure .... I think there are probably different ways to view and respond to this sort of thing. I was struck by Gareth's compositional suggestion to you on the other thread, which seemed a sort of artistic response, judging the image more in pictorial, painterly terms, with 'rules' of composition as a guide. But your response suggested that you had a different set of rules in mind, more about the objects relationship to what it was near or attached to, and a more scientific, literal recording basis to the images. That's quite a collection... fascinating actually... interested in your thoughts on putting this together... particularly re finding/selecting... one off, or part of a project? Before a full response to all your interesting comments, could I ask Nigel to give me a nudge in the direction of the comments from Gareth, in "the other thread", to which he refers? It makes me want to create something similar from my wildlife area. It would be fascinating to create a series of found items from the same area at different times of the year. Hi Roger, the comment from Gareth is in your Aesculus Hippocastanum II thread..... He suggested a crop to improve focus on the key subject. I doubt he, or many others, would have even considered your response, which seemed to be based on scientific and accuracy aspects, rather than a traditional artistic /compositional view. Two very different ways to evaluate and respond to the image. Two different functions of photography, even. That's not to say your images have no artistic qualities, of course not.... But it's not really the primary motivater it seems. I take photos of flowers, and I very rarely have any idea of what they are called .... I doubt that would be the case for you. Thanks, Nigel, i'd forgotten that....! I suppose my photography motto could be "Art & Science, not mutually exclusive"! This image, "Found", is just a continuation, an evolution of my Art & my interest in Science. Some posters on the primary school classroom wall. Published by Shell, they depicted scenes from nature, of all the differing forms of life, particularly in this country.A lot of these scenes can still be Googled,. And found. A little more recently, I have developed an interest in chiaroscuro & how it can be applied to photography, following examples in classical art. I've been making images thus guided for a while now. 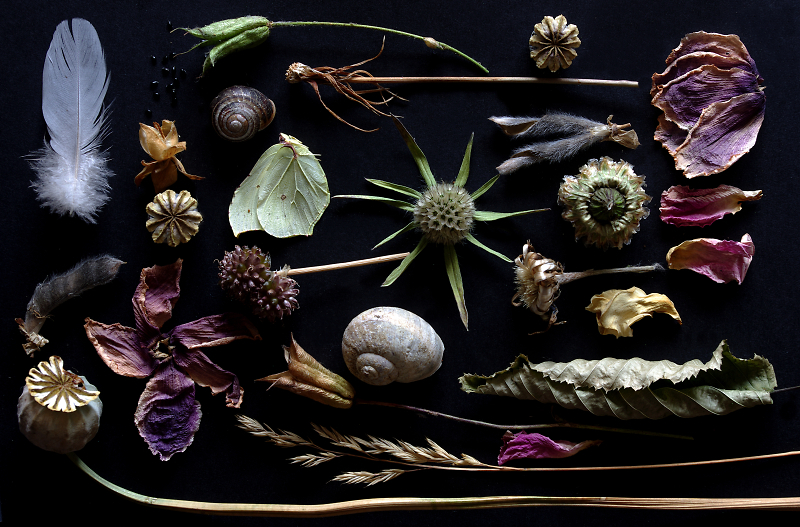 This has led to making still life images in a more traditional manner, onto using flowers & leaves, some in various states of decay, And then an interest in seedpods, their forms, colours & textures.
! would heartily encourage anyone/everyone to Google her name & experience the images she produces, using a flatbed scanner! They are very different & very beautiful, imho! So, none of the above was a conscious line of logic or anything like that. I'm just trying to outline how I came to be here, posting an image like this. So this snap is not an exercise in any one discipline, it's just made by me, today. Tomorrow will be different. Not better. Not worse. But it will still be mine. And me. Take me as you find me! I thank you all so much for taking the time to look & comment. I'm pleased when you like what I do. I don't really mind if you disagree with what I do. I, for one, know that I'll be different next time! Bill, none of my stuff is a "one off", but a Project.....? Dunno! Good idea Nigelk, go for it. & any image that requires those frustrating 1/3 stop over-exposure adjustments . I am trying! A really interesting image, expertly photographed, it caught my eye straightaway. One thing is that I find the dead butterfly strangely disconcerting amongst a collection of mainly plants, but to me its inclusion is utter brilliance as it in itself it looks almost more plant-like than the plants do! We need to see more of this level of creativity. ...... Nigel, please excuse any image I post from now on NOT taken with flash!! , & any image that requires those frustrating 1/3 stop over-exposure adjustments . I am trying! Roger. Well, you know, 1/3rd really makes all the difference! You can certainly be excused not using flash when you have such good control over the natural light. As I said on the Petals thread, you have created an impressive balance of exposure and control over contrast which is so often impossible to gain with natural light. No doubt still life situations are more favourable than when shooting portraits out and about.